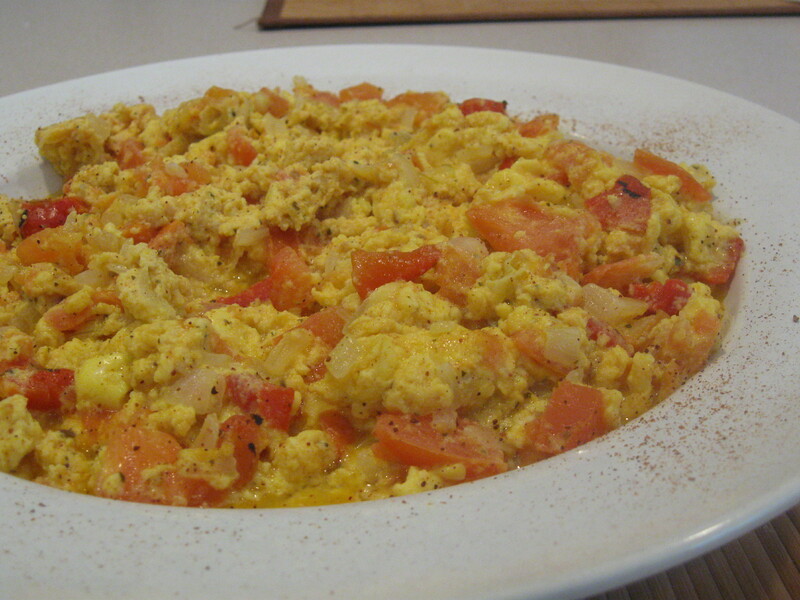 My egg and tomatoes recipe today is much closer to Vicky’s. Still, with some modification. This version is so much richer than the one I posted a while ago. Give it a try. The secret ingredient in both recipes is the nutmeg. Don’t leave it out and if you don’t have any, remember to grab some next time you’re in the super-market. The ingredients are good for four people. How to make: Heat the oil in a pan and saute the onion, about 5 minutes. Add the diced tomatoes, sugar, basil, roasted red peppers. Cook in moderate heat until the tomatoes are soft and there’s not much liquid left. Add the beaten eggs and stir lightly with a wooden spoon. Let the eggs firm a bit. Give it another stir, let them firm, repeat until they are cooked. Check for salt. Sprinkle nutmeg generously. Give it a stir. You can also add some more nutmeg when you serve. Enjoy! Notes and tips: You need nice, ripe tomatoes with soft skin which can be easily removed after you dip the tomatoes momentarily in hot water. If the tomatoes are not ripe, they’ll make the dish watery. My tomatoes were ripe enough to be able to peel at least part of the skin with a knife so I spared myself the dip in hot water. this one looks really delicious! And indeed it is. Thank you!